Roland’s DWP-80S dental 3D printer is bundled with new feature-rich, user-friendly Quick Denta software, ideal for the creation of 3D-printed prosthesis such as custom trays, denture base plates, and partial frameworks for casting. Components of all types can be printed in three steps using the pre-configured workflow wizard. Sculptor ECHO is a DLP LED technology based 3D Jewellery Printer. It is one of the most productive and profitable members of your jewelry manufacturing team. Achieving superlative surface finish, Sculptor ECHO helps you work smarter with casted models. Proxbotics Creation Technologies Pvt. 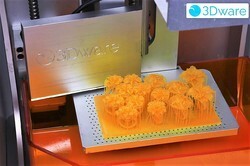 Ltd.
DLP (Digital Light Processing) 3D Printing is a form of additive manufacturing technology. 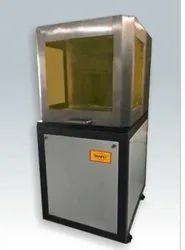 It is used for creating models, prototypes, patterns, and production parts in a layer by layer fashion using photopolymerization, a process by which light causes chains of molecules to link together, forming polymers.